This recipe first appeared in the February newsletter. If you’d like more simple recipes, add your email to the free sign up. I know it’s summer when I no longer desire porridge in the morning and switch to muesli for breakfast. 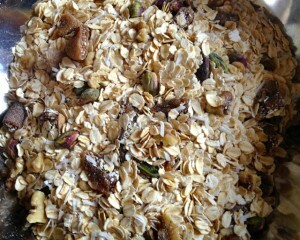 Over the years I’ve made many variations of this simple muesli depending on current desires and what’s in the pantry. I’ve found it’s easier to tailor your quantities to the storage container you’re using, rather than fixate on exact amounts. My latest batch contains chopped walnuts, raw pistachios, shredded coconut (best stored in the fridge between batches as can quickly go rancid) and chopped figs. Toss together in a large bowl until thoroughly mixed. Store in a sealed container. Muesli is best soaked overnight in your favourite type of milk, to soften the oats and make the nutrients easier to digest (unlike granola*). It’s easy to prepare and looks rather lovely combined with milk in a small jar for breakfast on the run or to take to work. To serve: as is or add some fresh fruit (I tend to go easy on the dried fruit in the mix, in favour of all the wonderful fresh produce around in summer). If you like a bit more crunch in your cereal, add puffed grains or a crumbled rice cake before eating. * A word on toasted muesli/granola. Grains contain phytates that bind the nutrients, so they’re difficult to utilize on eating. This is overcome by soaking but not baking. What’s more toasting grains and nuts changes the oils and makes them prone to free radical damage (baddies!). This also affects the added oil to make the granola crunchy. And don’t get me started on the various ‘natural’ sugars (honey, maple, agave etc.) that basically turn them into dessert! There are more muesli recipes and breakfast ideas on my website.